School bus games is a bus driving game which only involves with the primary objectives of picking up students from a bus stop, and dropping them at school., all while maneuvering the school bus which is under the player’s control. A school bus game features an open world, which can be a top-down two dimensional view or three-dimensional world. The control schemes are very much familiar with other bus driving games such as the directional keys for acceleration, deceleration and turning the bus. The space bar usually brakes the bus to a halt. Unlike the generic bus games, a typical level has double the challenge. Not only does one need to maneuver through the obstacle course, be it the traffic, or turnings, but every level has two goal points. One is the bus stop where the school students are to be picked up. Second is the final stop in front of the school. Not only is timing the key, one needs to be familiar with the roads where the bus is driven. This will help to eliminate the need of looking at the city map which are provided for navigation convenience, but at the cost of more time. However, one can always try for the best score as all unlocked levels can be replayed again. Having discussed the main aspects of the game, we discuss how to aim for the best scores. First of all, one needs to know the shortest path from the starting point to the bus stop, onwards to the school. This ensures that where level time is concerned, one can earn a star on the level by completing in the least possible time. Another factor is of course, navigating through the course without colliding with anything. A level can also be terminated if the bus receives enough damage. A good control allows to swiftly navigating the bus. This in turn ensures faster level completion. There are both two dimensional top-down school bus games that are available on gaming sites that are based on Flash as well as three dimensional games on both Flash as well as smartphones. 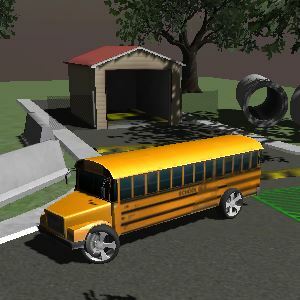 One example of a top-down two dimensional game is School Bus Driver which is an online Flash game. It has all of the above features, and the challenging aspect is that one needs to be able to adapt to the bus orientation, especially for first timers. Touchscreen games like School Bus Mania : 3D Parking provide an HUD, one for the direction that points towards the correct route to either the bus stop or the school, as the case is. Other elements on the screen include controls for steering the bus, either by touching and rotating the wheel, or tilting the device. Other controls need to be tapped on, that is the gas and the brake pedals as well as the gear control. One advantage of the three dimensional games over the two dimensional game is that with the help of the pointer, one need not know the entire location, and this also makes it gamer friendly.